It’s raining, it’s pouring! Time for a toddler rain coat! If they’re dressed right, toddlers can be out in all sorts of weather. Most toddlers love both mud and water, and they love rainstorms, too, as a happy conglomeration of both. It’s good for your toddler to be outside whatever the weather, too, so long as he or she doesn’t get too hot or too cold, or stay soaked for too long. Exposure to different weather and different seasons adds a whole new compartment to your child’s brain development, and the experiences she gains wandering through a forest with you during a violent rainstorm can’t be replaced in any sterile preschool setting. So… if your toddler is going to be out in the rain, you need to get your act together and get appropria rain gear ready! If it’s really hot your toddler may have fun running about in a rainstorm with next to nothing on, but wet clothes get old quickly. And for colder autumn rainstorms stay-dry clothing is essential. Rain boots are the top priority purchase, because feet do worse with wet than any other part of the body. After that, you’ll need to buy your toddler an adequate rain coat. What are the best rain coats available? 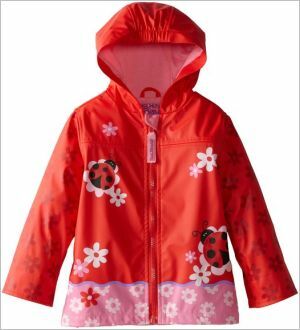 An online search brings up the top rated rain coats; rain coats that other parents who’ve bought them for their children rave about. 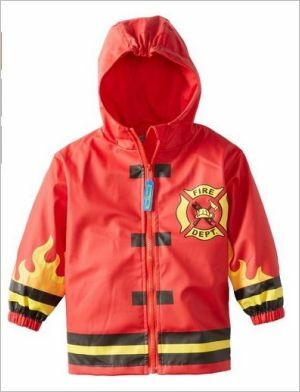 The Stephen Joseph Boys 2-7 Rain Coat gives you the choice between two patterns, dino or monkey, and another listing offers a firetruck or pirate design. Why do parents like these coats so much? To begin with, they are very comfortable for little people to wear: the inside lining is comfortable, breathable 100% cotton. The coats are well-designed, and the sleeves have elastic in the hems to keep rainwater out. The outer layer of the coat is soft, but also completely waterproof. It won’t matter if your child is standing in a downpour: they’ll stay cozy, warm and dry. The other reason is that Stephen Joseph seems to have a monopoly on cute raincoat designs, and every one of the many option is a piece of art. What is more, there are coordinating umbrellas and boots that will make your toddler look like he or she just stepped out of a picture. What is the downside to these rain coats? 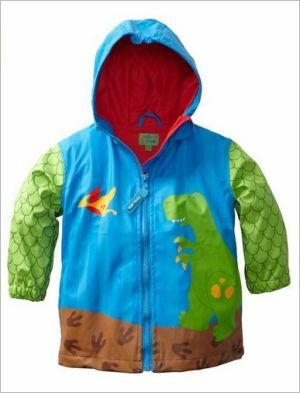 The only real problem we could find was the price; if you are on a tight budget, there are certainly other cheaper toddler rain coats you could buy instead. On the other hand, they won’t be as well made, won’t last as long, and won’t look as nice, so maybe it’s worth shelling out the cash anyway! After all, those pictures you’ll take of your toddler in his or her adorable rain coat will be around for a long time!